Slip during the earthquake occurred on 35 km of fault at depths ranging from 7 to 20 km. Maximum slip was approximately 2.3 m. The earthquake may not have released all of the strain stored in rocks next to the fault and indicates a potential for another damaging earthquake in the Santa Cruz Mountains in the near future may still exist. The earthquake involved a large amount of uplift on a dipping fault plane. Pre-earthquake conventional wisdom was that large earthquakes in the Bay area occurred as horizontal displacements on predominantly vertical faults. The fault segment that ruptured approximately coincided with a fault segment identified in 1988 as having a 30% probability of generating a M7 earthquake in the next 30 years. This was one of more than 20 relevant earthquake forecasts made in the 83 years before the earthquake. 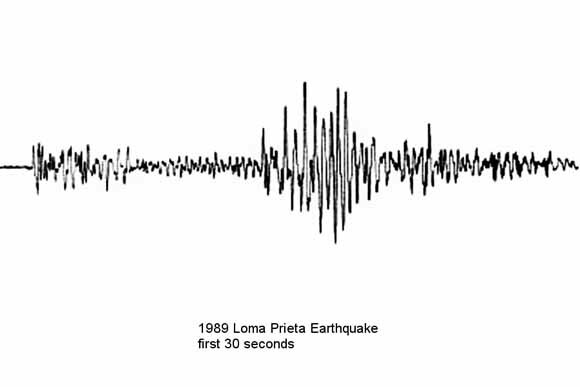 Calculations show that the Loma Prieta earthquake changed stresses on nearby faults in the Bay area. In particular, the earthquake reduced stresses on the Hayward Fault which decreased the frequency of small earthquakes on it. Geological and geophysical mapping indicate that, although the San Andreas Fault can be mapped as a through going fault in the epicentral region, the southwest dipping Loma Prieta rupture surface is a separate fault strand and one of several along this part of the San Andreas that may be capable of generating earthquakes.